This page describes the project planning process used in DM for software development. This process is a fusion of NSF and Federal mandates for Risk and Earned Value Management and Project Planning with Agile Process. Our nickname for this process is “Agile for Government”. As LSST is now in Construction and funded under the NSF MREFC budget, the planning process has become more formal than was the case in R&D. For the primary work plans during Construction, the following process has been used. 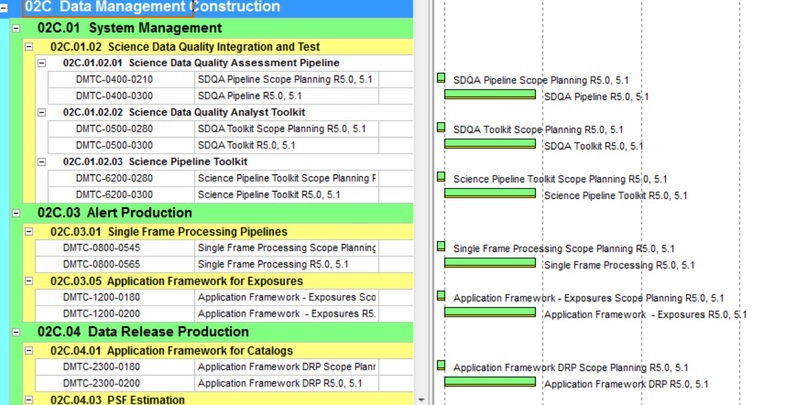 Using the flow-down of System Requirements (LSE-30) to DM System Requirements (LSE-61), LSST Program Schedules, LSST Operations plans, and a DM section of the Risk & Opportunity Register that assesses the perceived programmatic and technical risks, a set of time-phased software capabilities and key progress metrics for the DM System has been defined. 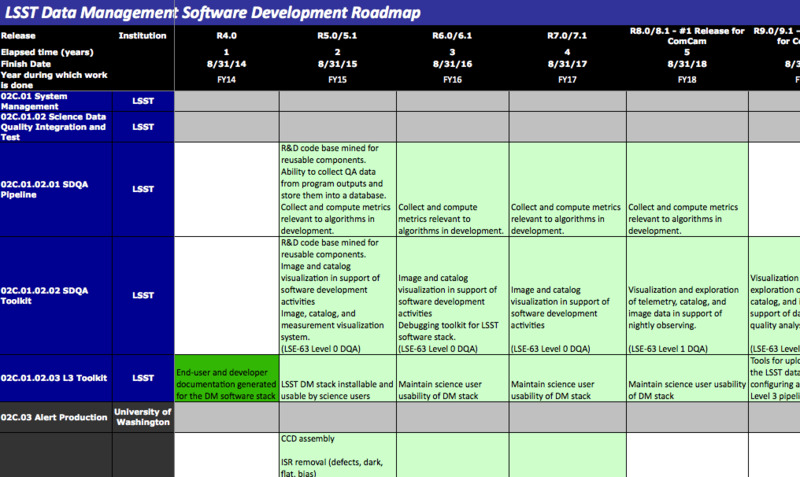 The DM Roadmap (LDM-240) “bins” these planned software capabilities and key progress metrics into “coarse-grained” 12-month periods. These activities encompass all major DM R&D work in all areas (DM System Management and Engineering, Applications, Middleware, Infrastructure). 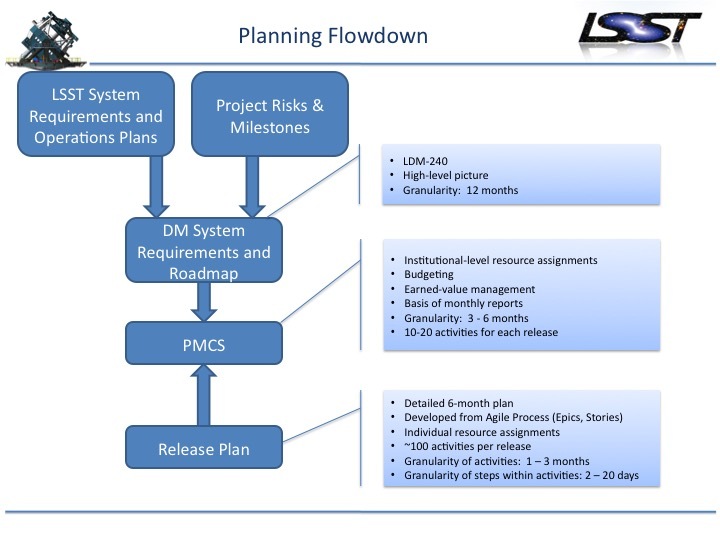 In the LSST Project Management Control System (PMCS) the DM Project Manager creates and maintains software and data release and management/system engineering project plans that encompass the entire Roadmap and add the next level of detailed work planning. In addition, the plans cover activities specific to preparing and conducting formal reviews. The granularity of the release activities in this plan are 3 to 6 months each. Each activity includes the activity description, expected start and end dates, and resources assigned. Inter-activity dependencies are also captured to allow for critical path method scheduling and analysis. This plan is the “top-down” plan for the entire Construction phase. It is the basis for all LSST budgets and the Earned Value Management required by the MREFC process. At the start of each 6-month period (aka each new Winter or Summer Release) each DM Cost Account Manager (T/CAM) interviews the institution team and creates a very detailed work plan, with individual activity granularity from 1 to 3 months (see the T/CAM Guide ). Further, each activity is divided into steps of 2 - 20 days effort. This plan is known as a Release Plan. This process is done via the Agile Process, including backlog and sprint meetings, interactive communications, and design reviews. This process is accomplished in JIRA Agile, outside the PMCS. Then plan is incorporated into the PMCS. Once work starts on the release, this level of plan is tracked on a weekly basis, and the status is rolled up to the PMCS (see DM Reporting Process below). The PMCS actually includes all activities to be performed during the current release period, even those that are not directly part of the data production and release (e.g. LSST and Agency Review activities, level of effort activities covering periodic meetings such as risk management meetings, etc.). While the plan includes both release and other activities, the plan is coded in PMCS so that those activities that are part of the data production and release can be easily identified in filtered views of the plan. The DM project (including all DM contracted institutions) is legally required to provide monthly status reports to LSST senior management, including the AMCL. These monthly reports are also provided to the funding agencies, and are audited annually by Federal auditors. Non-compliance with reporting requirements is cause for contract termination. As discussed above, the DM Project Manager maintains release and management/system engineering plans in the LSST PMCS. Each activity in the plan includes the name of the activity, expected start and end dates, and assignees (with primary/lead person listed first). The LSST Project provides JIRA Agile, a web-based tool for Agile development. JIRA Agile is used as a means to capture the Epics and stories that are imported into PMCS in the Release Planning process described above. As the team performs Agile sprints, stories are marked as Done when they are implemented. The story status is imported into PMCS for monthly status reporting against the plan. The status collected marks the stories (Steps) as 100 % complete which updates the Epic (Activities) % complete, and sets the actual start and expected finish dates. The LSST Project Planner exports the list of recently completed stories from JIRA Agile into tables, sorted by WBS and Epic, and imports the status into PMCS. Each DM partner institution T/CAM verifies that stories have been correctly mapped into Epics and Sprints. Large-scale issues that affect the overall release schedule or scope are discussed at the weekly DM Leadership Team meeting. The LSST PMCS planner publishes PDF files of the current release plans. DM team discusses status, issues, blockages, progress in Release Coordination Standup Meetings. The assignees (or “primary resources”) mark completed stories as Done in JIRA Agile. The LSST Project Controls Specialist imports the updated story status into PMCS. The first week of the month, the LSST Project Controls Specialist creates an “extended” progress report, which indicates the progress of all the activities and shows any Earned Value variances. The second week of the month, the DM T/CAMs submit narrative to the DM Project Manager, describing both the last months accomplishments and the next months plans. The T/CAMs also submit narrative explaining any EV variances that are above a defined threshold. The third week of the month, DM Project Manager assembles both an Extended Report containing all detailed narratives for each institution, and a Summary Report which excerpts high-level accomplishments and plans across DM institutions. The Extended Reports have been examined every year by Federal auditors to check that the DM Project Manager is monitoring the work performed/progress by each contracted DM institution. The Summary Report is prepared for submission to senior management and for inclusion in the monthly report to the AMCL. The DM Project Manager posts both report in Docushare Collection 221. The fourth week of the month, the LSST Project Manager and Project Controls Specialist prepare and submit the report to the funding agencies. These reports are also included in the quarterly and annual reports to the funding agencies.